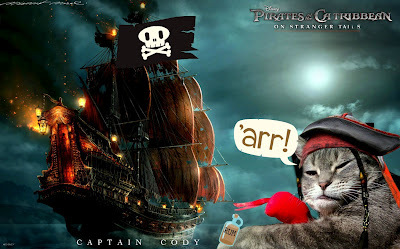 Cat Chat With Caren And Cody: Meow like a #Pirate Day!!! Meow like a #Pirate Day!!! Well avast mateys!! It's that time again! Today is actually International Talk Like A Pirate Day but in the interest of our kitty furiends we call it MEOW Like A Pirate Day!!! We have blogged about it before and today we want to share our favorite photos from this fun day with you! Our first photo is our ALL TIME FAVE! It was done by our furiend Mr.Puddy (we sure wish he would blog more often like he used to! We miss him!) for Cody to use on his first Pirate Day! And now for your listening pleasure! One of Mom's most favorite movies in the entire world is Disneys Peter Pan. Mom LOVES the song, "Never Smile At A Crocodile" from the movie. ENJOY!! HAVE A HAPPY PIRATE DAY!!! Ahoy there dear Mateys! 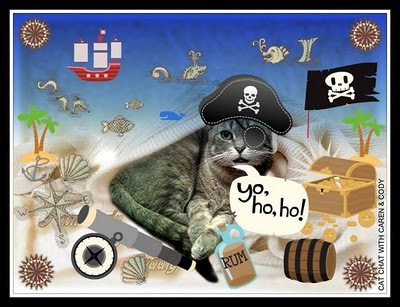 Your dreaded pirate pics are purr-fect! Ahoy! Have a great pirate day! Those are all great pictures! Shiver me timbers........yo ho ho and a bottle of milk. Have a tremendous Thursday. Cody we think you AND your Mom look quite fierce on Pirate Day! Arrrrrgh! Arr! Yer mom be a fearsome pirate fer sure. I'll be along to join ye in a drop o' grog afore the day is out. Arrrr! Great pictures for Pirate day. Hope you find all that treasure. Lots of luck in your sailing. Take care. 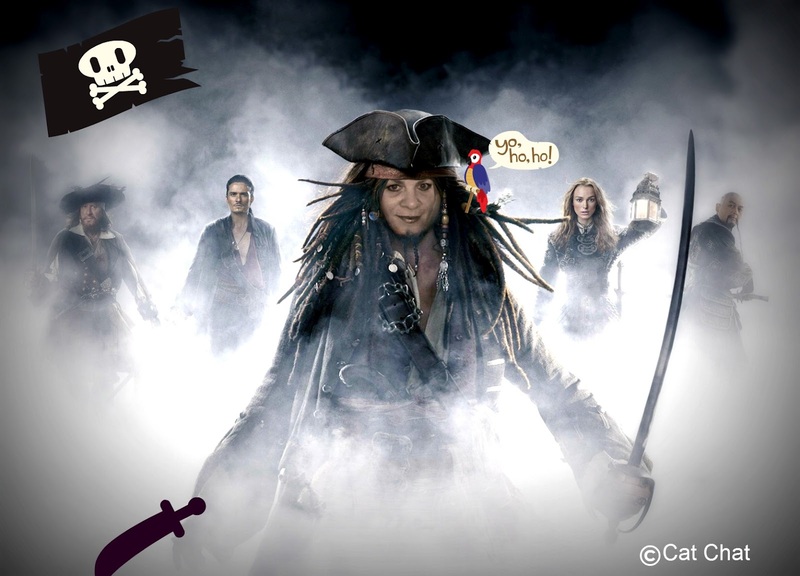 You make a great pirate Cody. Happy Pirate Day. Arrr - these be fine photos from ye old pirate days! What a fun day...you both make wonderful pirates! Now that's what I say meowin like a pirate is all about!!!! The first pic is our fave! Thank you very very much for the video. Now Mommy has been singing Never Smile at a Crock-o-dile over and over and over. Which one of you wants to walk the plank??? MOL. Mommy never watched Peter Pan so this is the first time she's heard the crocodile song and it made her laugh! Happy Meow Like a Pirate Day, Cody! You and Mom look Pirate Purrfect Cody! Hi-ho buckos, ye're fierce band 'o pirates! Yer Mom be a mighty fine wench! Arrr, we're ready to share some grog with ya. Ooh arrrr, me hearties. Tis that human scoundrel, Gary, sending pirate thoughts to Captain Cody. We be droppin' the anchor to tip a cup o'grog wif ye! Ye look like true blue pirates to be sure! We tip our (pirate) hats to thee! Arrrrrgh! We be havin' a fine Meow Like a Pirate Day! Arrrrr! Ye be a scurvy pirate as does ye Mama. Heh heh. Very cute post. I had a lot 'o a ruckas commentin' this day. Translated that means I had a lot of fun reading pirate posts today. Arrrrrgh! We be looking for some grog! And bring out your tuna, so we be havin' a fine Meow Like a Pirate Day! Ahoy, you speak excellent 'pirate'! Have a great day! They be all great photographs 'o cap'n Cody! thar be no bandit that would dare defy ye or Cody after seen 'tis! Har Har Har get ye the treasure me hearties! Cody I think that you and your mom made some pretty PAWSOME pirates!! !